Paul Hankin came up with a formula to calculate a Fibonacci numbers without recursively (or iteratively) generating prior ones. Don’t get too excited: his non-iterative, closed-form solution in O(n²). That means it’s slow when n is big. I was curious how well this would do in Perl. It’s very fast in Python and dog slow in Perl. Perl’s @INC might find code that you don’t want. That array is list of directories that use, require, and do search to find modules and libraries. By default, the last entry has been ., which represents the current working directory. That’s not a real directory; it’s a pointer to a directory you’ll discover later. There’s a fix for one consequence of this problem, but there are still issues of trust. That’s security—there are always more problems. 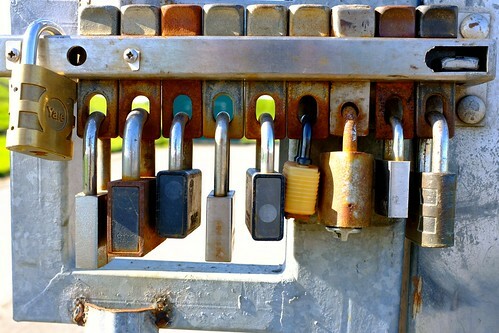 “Locks”, by Chilanga Cement on Flickr. Although Perl is no longer finding the excellent numbers, it’s still a big part of my process. Perl ran out of steam a long time ago, but it’s still managing everything. I could do big numbers through the Math::GMP module, the time to convert between Perl data structures and GMP data structures kills performance. But, I don’t need Perl for that part. I switched to a pure C program for the number crunching part. That does make me appreciate Perl a little more as I do really common things with a lot of typing in C.
I’ve noticed some curious patterns in excellent numbers. This relates to the Perl stuff I wrote about earlier, but this post isn’t about the Perl. A Perl distribution’s build file is often a neglected program. The community has standards for code in the modules, but we ignore quality (or kwalitee) in Makefile.PL, the test programs, and other ancillary code.